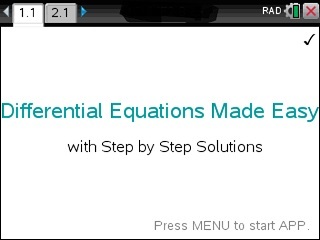 The most comprehensive Differential Equations Solver for calculators. Includes Slope Fields, Euler method, Runge Kutta, Wronskian, LaPlace transform, system of Differential Equations, Bernoulli DE, (non) homogeneous linear systems with constant coefficient, Exact DE, shows Integrating Factors, Separable DE and much more. Step by Step – Inverse LaPlace for Partial Fractions and linear numerators. Step by Step – Eigenvalue and Eigenvectors. Step by Step – Cauchy-Euler D.E. of order 2 and 3. Step by Step – Differential Equation Linear in x or in y (even using VOP).